As Toronto wedding photographer, I'm often asked by my couples to take their engagement photos. Engagement sessions are controversial topic among wedding photographers. First, because I am busy shooting weddings on the weekends I to photograph engagement sessions only during the weekdays. Second, some Toronto wedding photographers consider engagement photo shoots not worthed the effort because the profit per hour is lower than in case of a wedding. I personally have a slightly different opinion. E-shoots are fantastic opportunity to know my clients so that on their wedding day I am already their friend and not just a guy with a camera. That, in turn, helps my couples relax and helps me create wonderful wedding pictures. In my experience, I noticed that the first half an hour to an hour in any photo shoot, including wedding day portraits, the results are not spectacular. That time is a warm-up period and when a client selects an eight hour package, it means that it takes them about 20% of the time to warm up. As such, I am a big fan of pre-wedding or engagement photo shoots. Even more important, pre-wedding photo shoots are a perfect opportunity to experiment, to create new concepts and try them out. This particular engagement photograph is such an example of a new concept I tried that day. For this environmental portrait I created a contraption made of three mirrors glued together with Scotch tape. For the shot, I selected St. Enoch Square in downtown Toronto, not too far from Massey Hall. This is one of the last images we created that evening. Here we can see the bride and groom holding each other. Because it was fairly cold that September day, the groom offered the bride his jacket. After that, I asked him to hug her from behind and then kiss. At this time, I placed my mirror contraption in front of the lens to create a few beautiful reflections of the couple in the background. If you're unfamiliar with St. Enoch Square, it is a tiny gem, virtually unknown in downtown Toronto. What makes it special is the graffiti walls in the square. Many of my couples have outdoor weddings so they love urban settings and more specifically graffiti walls for their engagement portraits. What Makes This an Outstanding Engagement Photo? Here are the elements that make this a special pre-wedding photograph. First, the intimate pose gives this image a candid feel. Second, the lighting in this image is unusual. 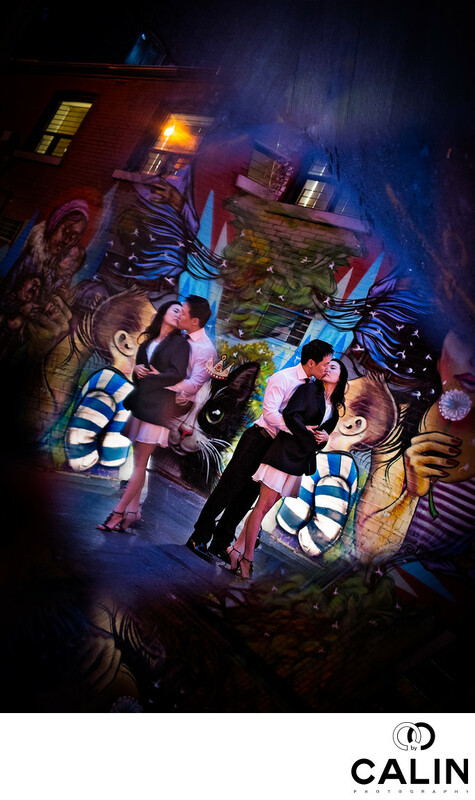 Despite the fact we photographed after sunset, I managed to light not only the couple but also the graffiti wall behind them. It placed a flash shot through a translucent umbrella to light the backdrop and the second one to illuminate the couple. Third and more important, the reflection of the couple makes this an outstanding image. Also, my three mirrors act as a framing device bringing the viewer's attention to the couple, the subject of this engagement photo. Last and also very important, the Dutch tilt gives this image dynamism, which combined with the reflections make it even more powerful. Location: Saint Enoch Square, Toronto, ON.